No doubt many of you have seen, or been tagged on, a FB meme to post (without comment) the covers of 10 albums that changed your life. I played along with my 10 choices for pop music, but then followed it up with 10 days of classical music albums–but for those I couldn’t remain comment-less. You might notice that this roughly chronological list is light on orchestral music. That is because my gateway to classical music was through church choirs and my own interest in singing. 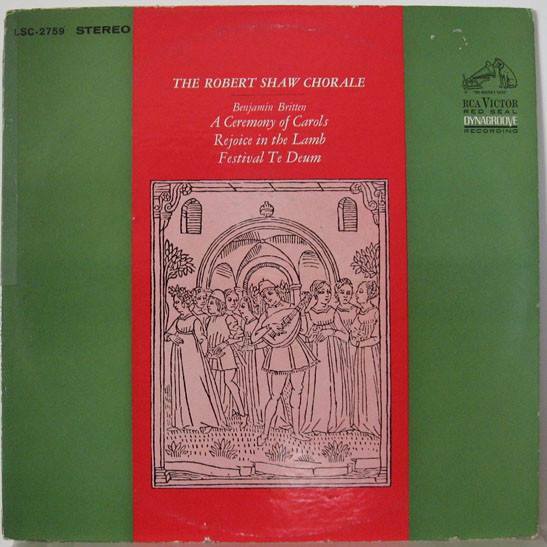 I was always drawn to choral works more than orchestral works. Over time that eventually changed and I now listen to tons of voice-less classical music, but overall, the records that really got me going had a vocal element. I think I discovered this one in the music library my first year at the University of Minnesota. 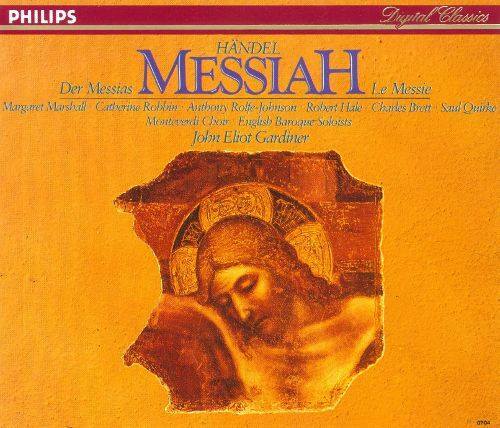 My initial interest in taking a listen to this LP was for Exsultate Jubilate, but what really blew me away was the concert aria Vorrei spiegarvi, oh Dio! 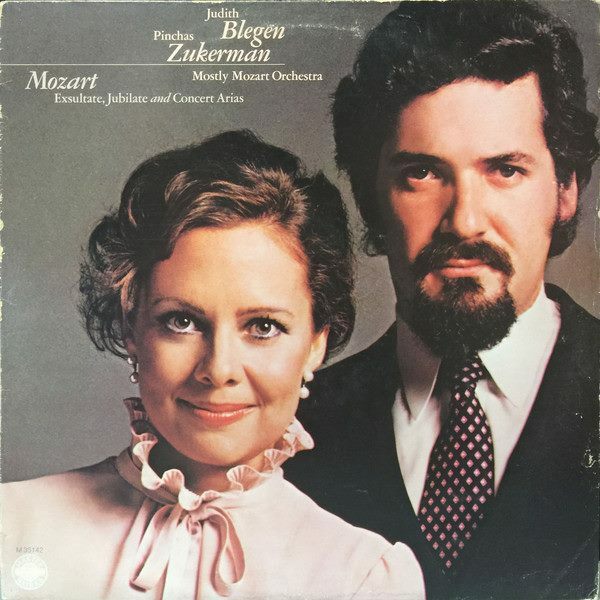 There are a few moments when you can’t tell the difference between the oboe and Blegen’s voice. I’ve heard many recordings over the years but none matches what she does in this recording. I’m so glad that streaming has brought the recording back into my life. I was really tempted to use the old Philadelphia/Ormandy/Mormon/Eileen Farrell LP for this one since that is the one I remember from when I was a kid. But the Gardiner is the one that restored my joy in the work. Anyhoo, the old Ormandy record is a nostalgic favorite, but after years of hearing and singing Messiah at community concerts etc. I was more than a little tired of the piece in general. 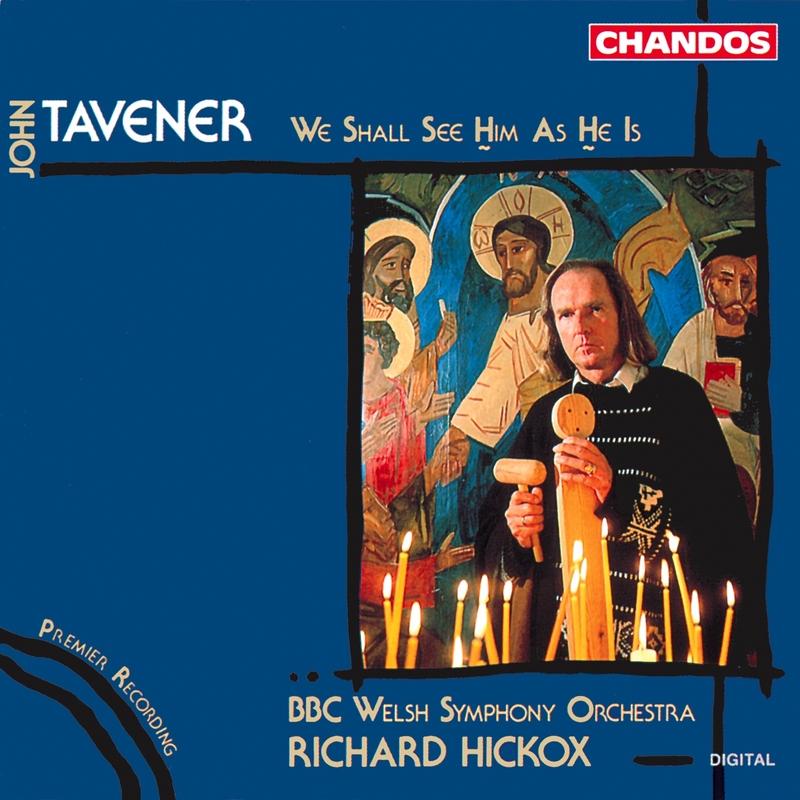 Then this Gardiner recording came out. It was, and still is, delightful in pretty much every way. The summer between 11th and 12th grade I went to a music camp for two weeks at the University of Minnesota. I was in the chorus (they also had band and orchestra). There were maybe about 30 kids in the chorus. Three of the pieces we studied/practiced/sang over those two weeks were numbers 1, 2, and 7 from Brahms Neue Liebeslieder Walzer, Op. 65. When the two (yes two) pianists at camp began the four-handed accompaniment for these Brahms pieces I was blown away. First the music itself is amazing, but then here were these two accomplished pianists going to town on what had to have been a 9-foot Steinway Model D. Crazy! And I got to sing with them. I bought this LP soon after that experience. Of course the pianists are amazing, but so too are the singers making up the quartet. 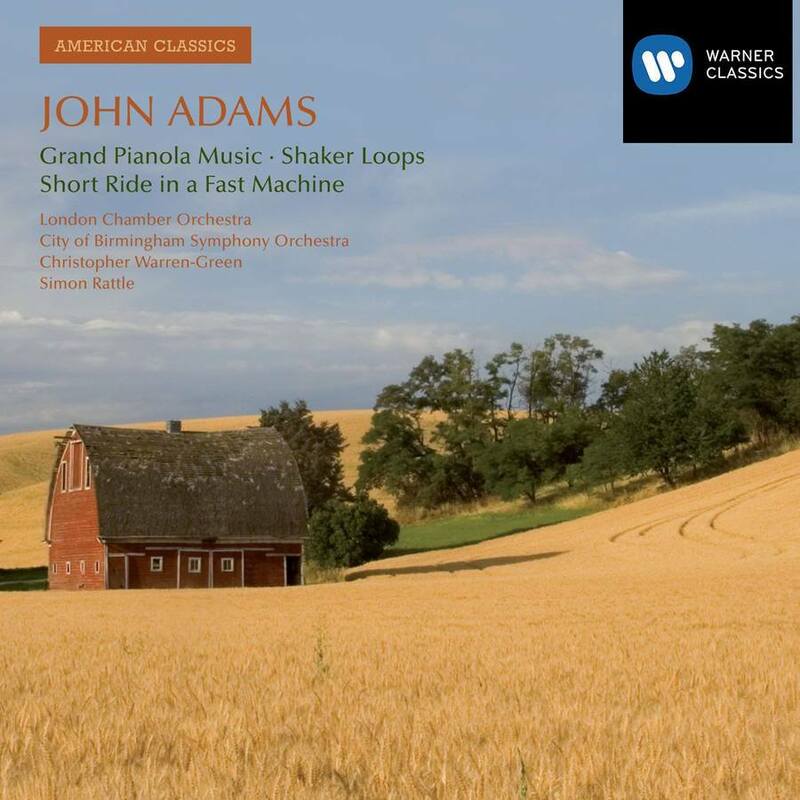 Although this is not the album that turned on the lights for me (as it were) it is a stand-in for all the John Adams CDs that I discovered in my late teens and earlier 20s. Short Ride in a Fast Machine, Nixon in China, Shaker Loops, Grand Pianola Music, etc. I loved all of it (his more recent stuff I am less drawn to). The summer after my freshman year of college I read lots of biographies and memoirs of classical music figures. One of those books was Joan Peyser’s biography of Leonard Bernstein. 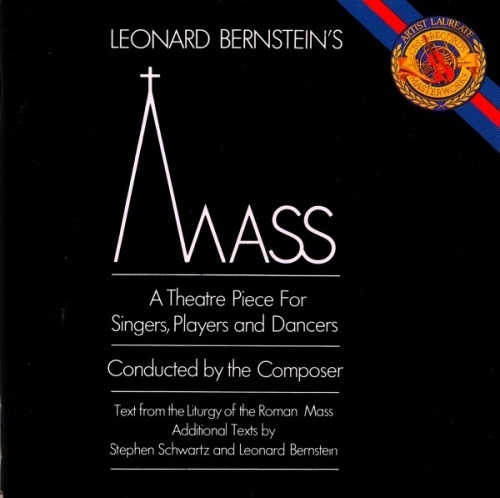 I became fascinated by the story of the premiere of his Mass which was commissioned to open the opera house at the Kennedy Center. Nixon had the FBI keeping tabs on rehearsals and after some observation of lefty Bernstein’s work, Nixon decided to skip the premiere. When I checked the record out from the library I wasn’t quite sure what to make of the work. It has some odd quadraphonic taped bits at the beginning and a lot of other stuff going on, but then it came to the Gloria and I had one of those head explosion moments. By that point in my life I had heard and sung a lot of Glorias, but holy moly nothing as electric as that. Over the years it has been disparaged, neglected, and revived, but no matter what anyone says about it, I love this piece to pieces. In recent years there have been a fair number of recordings, some of which are pretty good, but none, none, match the perfection of the original cast. The summer after my freshman year I was in a chorus that performed Mahler’s 8th with the Minnesota Orchestra and the Gothenburg Symphony Orchestra under Neeme Jarvi. 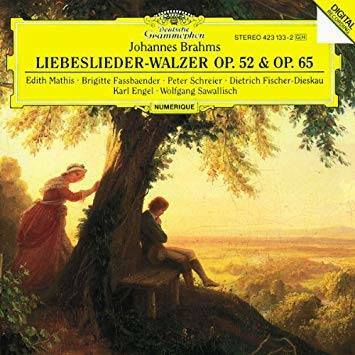 Up to that point I had never heard any Mahler, and if you have ever heard the 8th, you can imagine what that sounded like to a 19-year old–especially being part of, and in the middle of all that sound. It was an outdoor (under a tent) performance and I can still remember the headline of the review in the StarTribune: “Heat Deals Death Blow to Mahler”. 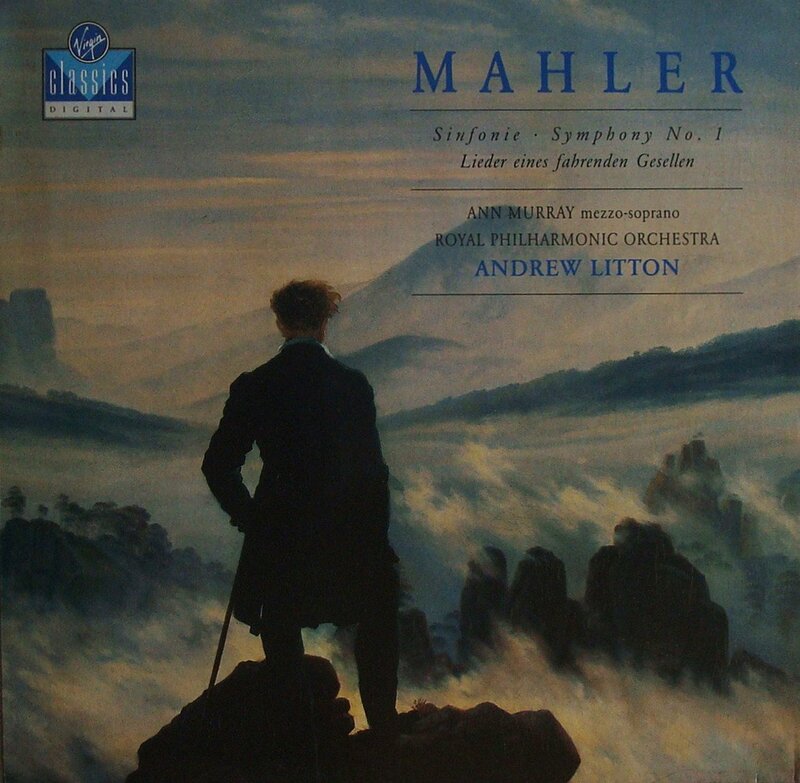 Today’s record is a stand in for all the Mahler recordings that I have loved over the years. It’s good, although not the best recording of the first symphony, but it is the one I cut my teeth on. After I washed out as a music (vocal performance) major and switched to history, I didn’t quite leave music behind. I had a Scandinavian history class for which I wrote a paper on Sibelius. And then I wrote my capstone history paper on Sir Edward Elgar, OM. That emblem of Imperial England who, as the Roman Catholic son of a shopkeeper who never studied at the Royal Academy, had none of the establishment credentials. 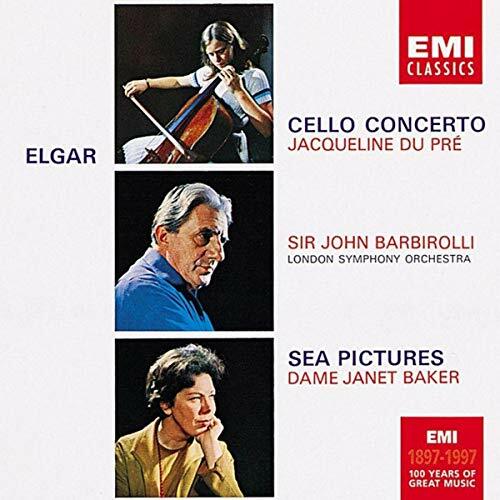 While I was writing that paper, friends of mine sent me this budget re-issue CD which did, and continues to this day, to contain the superlative recordings of both the Cello Concerto and Sea Pictures. No one has come close. Could Charles Ives or the New England Transcendentalists he was channeling in his Concord Sonata ever have imagined a 26 year-old Minnesotan living in Honolulu laying on a futon in his 3rd-floor walk-up cinder block apartment listening to this CD as the trade winds brought the scent of plumeria through the room? Of course they couldn’t, but I was very aware of the rather moving universality of it all when I first put this in my Discman. I found the first two movements of the Ives sonata exhilarating, but then the third movement, “The Alcotts” came on and it truly was a transcendent moment. Twenty-three years later I still think the movement is one of the most sublime five and half minutes of music I will ever hear. And especially as played by Marc-Andre Hamelin. This one makes the list not just because I think the piece is amazing, but also because I was in the Royal Albert Hall the night it was recorded at the Proms in 1992. I had a season ticket for the promenade “seats” (really standing room on the main floor) and I had no idea that night what I was going to be hearing. I loved the contrast between the grouped forces and the soloist and solo instruments, I loved the progression and repetition of certain musical themes, and I loved the soprano aria that starts in a very low register and ends up in so far above the staff I couldn’t believe it was Patrica Rozario singing both notes. The range for that one aria makes me think that is the reason I never hear of the piece being performed. There are moments where the orchestra and chorus just open up into this wall of sound and then drop away to the quietest of strings. Still gives me a thrill to listen to it. Just a beautiful post. My musical education is sadly lacking and I am a little jealous of how much joy it has brought you. Some listening needs to go on my retirement bucket list. Thanks for a peaceful Friday afternoon read. As one would expect, this is very eclectic and exquisite choice of classical music. I’m fascinated to read that you wrote a paper on Sibelius. That’s absolutely marvellous. I’ve recently listened to a lieder album of Sibelius, beautifully performed by Jorma Hynninen. I’ve always loved the voice of Edith Mathis and her straightforward style of singing. But I have never heard her sing Brahms before. So, I shall listen to her performance in the album you mentioned in your list. I also enjoyed reading your review on AB’s novel, ”Incidents in the Rue Laugier”. If you happen to visit your local newsagent or bookshop this week, I can recommend you to buy the current issue of LRB – London Review of Books (Vol. 41 Number 8, 18 April 2019). There is a free book inside this issue which is an anthology of essays and reviews previously published in the LRB. The free book is called “Frock Consciousness: Writing about clothes from the London Review of Books” and Anita Brookner is among the writers in this book. According to the official LRB website, the book alone costs £5.99 if you buy it separately from their website.